Last week at the Practical eCommerce Ignite 2015 conference in Dallas, I held a session on Email Design for eCommerce Success. With many years spent in both the ecommerce and the email world, that was the perfect title for me! Here are the thoughts I shared with the audience (BTW: to download the full presentation, click here). My teenage daughter a few months ago said to me… “Dad, I don’t even know how you have a job. Nobody uses email! !” Fair enough: she does not use email to communicate with anyone other than teachers and grandparents. Her communication tools include Snapchat, Vine, Instagram, Kik, Facetime, SMS, … not email. And yet, she wasn’t telling the full story. Her Gmail inbox is full of newsletters that she signed up for from her favorite brands. She may not be using email to communicate with her friends, but email is still one of her preferred ways to receive promotional messages. And the same is true for millions of others. 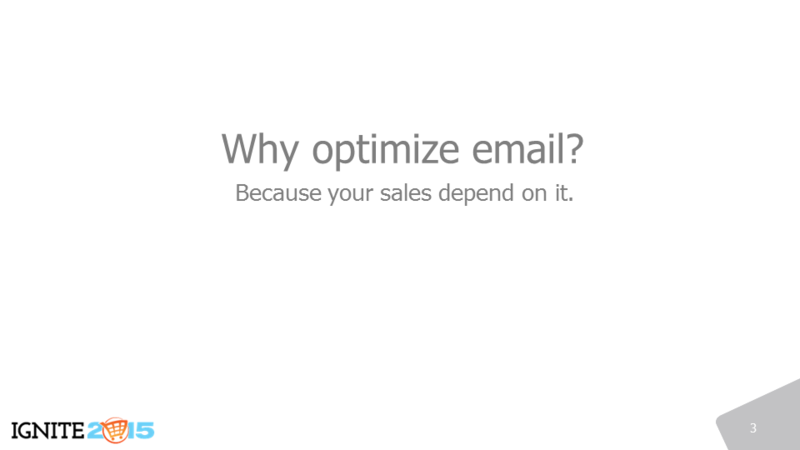 That’s why study after study reports that email delivers the highest ROI, why at ecommerce conferences there are plenty of sessions around email, and why it makes sense to spend time on optimizing email messages, starting with their design. 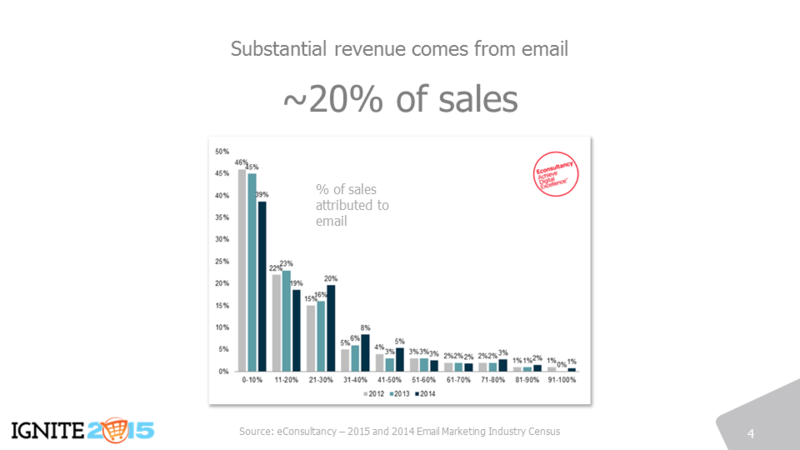 On average, companies report that roughly 20% of sales come from email (see below). Whether this figure resonates with you or not (channel attribution is a tough equation to solve! ), it’s hard to argue that email substantially contributes to a good chunk of ecommerce revenue. And it’s not just a matter of sales. The email address has become our de-facto digital passport (and we often have two or more passports: a personal email, a work email, etc.) and a powerful marketing tool. When used correctly, it allows companies to build lasting relationships with their most loyal (and highest profit-generating) customers. 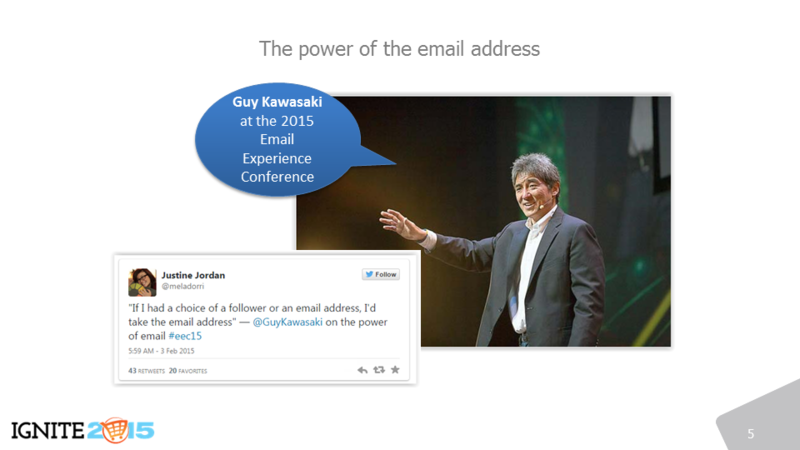 Which is why a social media guru like Guy Kawasaki, at the Email Experience Conference earlier this year said that he will take an email address over a Twitter or Facebook follower any day. Things have been changing very, very rapidly over the last 4-5 years. Before we start designing an email, we really need to ask ourselves a basic, but key question: whom are we designing for? For many of us: we are designing for a truly mobile audience. Many marketers have crossed the tipping point of over 50% of the recipients of their messages opening emails on a mobile device. And – by the way – the slowdown in the curve shown in the chart below is not at all due to a slowdown in mobile opens. The experts at Litmus clarify that the reason is strictly a technical one: Gmail no longer reports whether emails are being opened on Gmail Web or Gmail App. Taking that into account, mobile opens are likely around 54-55% right now (53% back in January of 2015, according to Litmus). For some companies, that percentage is even higher. This means that we need to think of a customer opening our emails on a mobile device as the new normal. We need to think of our customers first having a mobile experience of our email messages, and then, maybe, a desktop one. 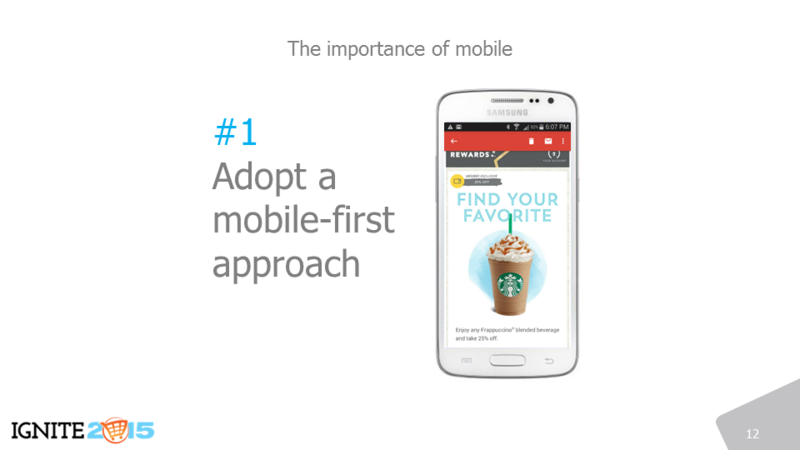 That’s what “mobile first” means: defaulting to mobile: thinking of a mobile user before any other user. And flipping the User Experience table in favor of a mobile experience has far-reaching impact on email design, Web design, online store checkout design, etc. Now, this is not true in all scenarios. For companies involved in mostly business-to-business transactions, mobile might still represent a smaller piece of the pie. 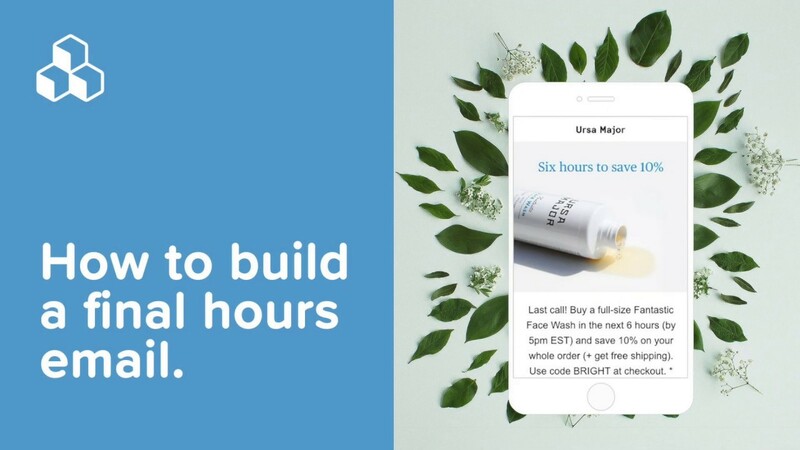 In our case at MailUp, for example, only around 24% of opens happen on a mobile device,… but if we look at B2C brand and customer of ours the percentage goes back up to almost 50%. 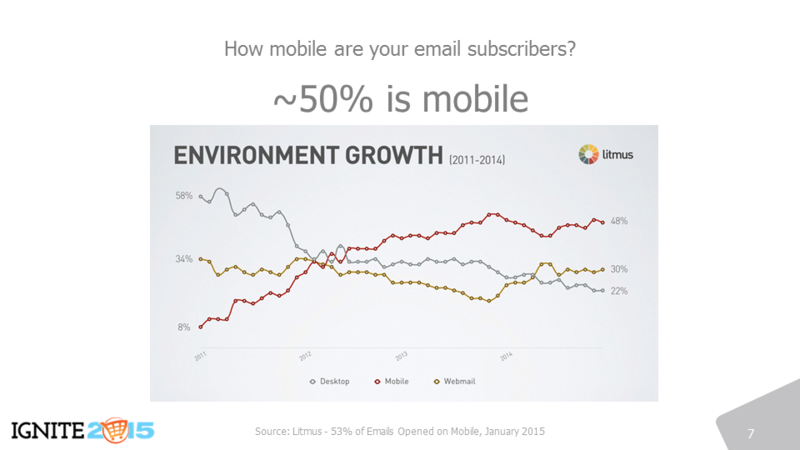 Something else is changing rapidly because of the switch to mobile: the email clients that our customers are using. 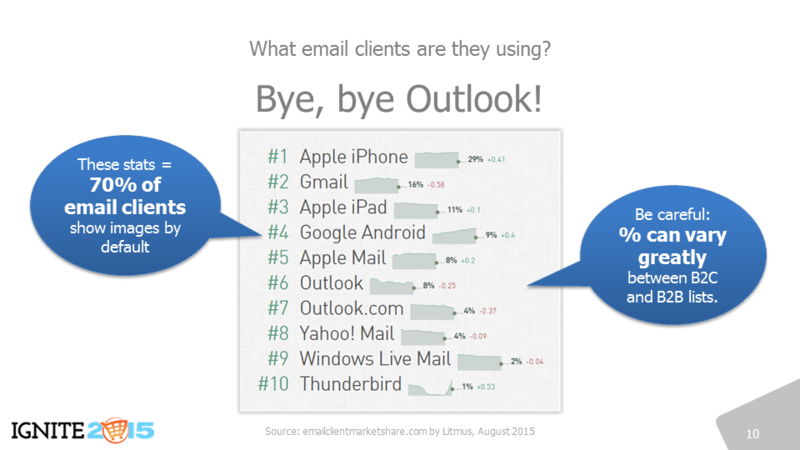 Outlook – king of the email client world until a few years ago – is now a distant #6 with less than 10% of the market (certainly higher in a B2B scenario, so keep that in mind). 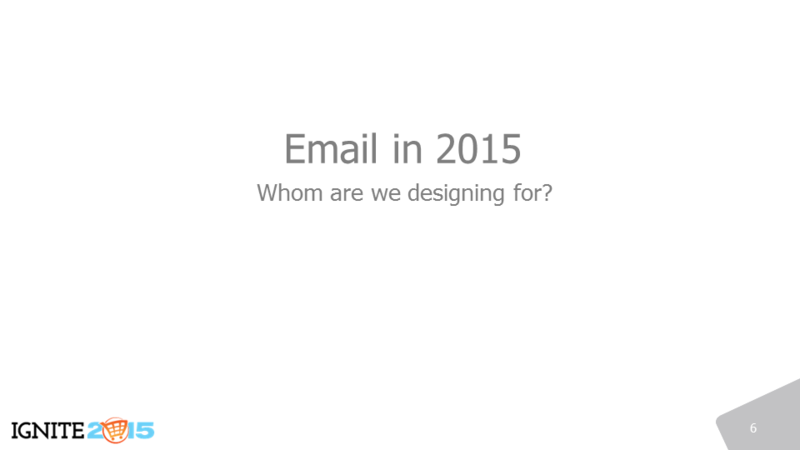 Why does this matter to email designers? 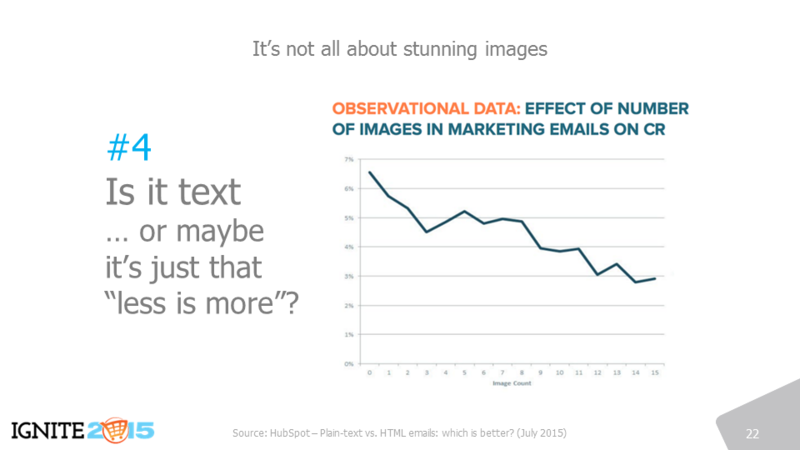 Because if you combine the top email clients, you discover that over 70% of your recipients are likely reading emails that download images by default, whereas exactly the opposite was true in a not-so-distant past. Good news! There’s not doubt that we are just scratching the surface in the following paragraphs. But it’s a start! 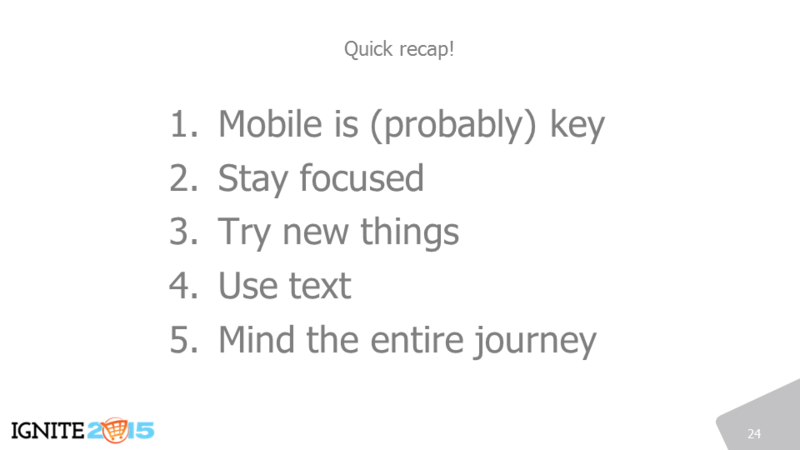 After all this email on mobile talk, we couldn’t start in any other way: think mobile first: bigger buttons, bigger text, simple message structure, responsive layout (e.g. 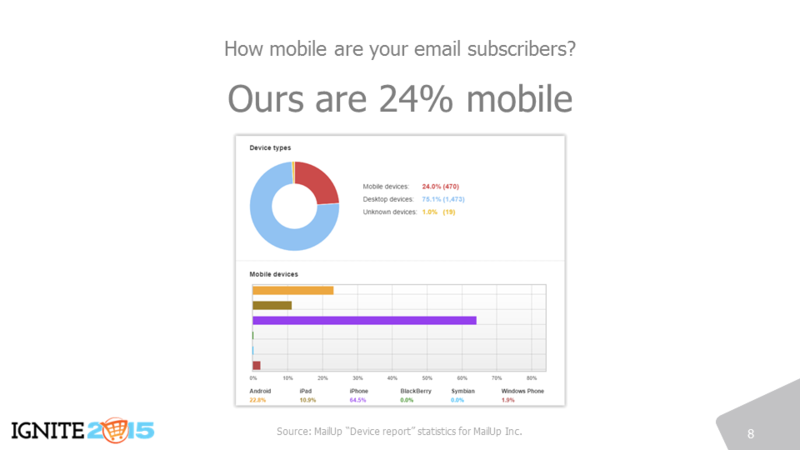 a two-column email becomes a one-column email when opened on a mobile device), etc. Surprisingly… check your inbox and you will see how many messages you receive, even from well-known brands, that are still not mobile-ready at all. Mobile-first also means recognizing the super-short attention span that mobile readers typically have. They browse through that inbox at the speed of light. Because of it, focused, uncluttered, minimalist messages often tend to work best. 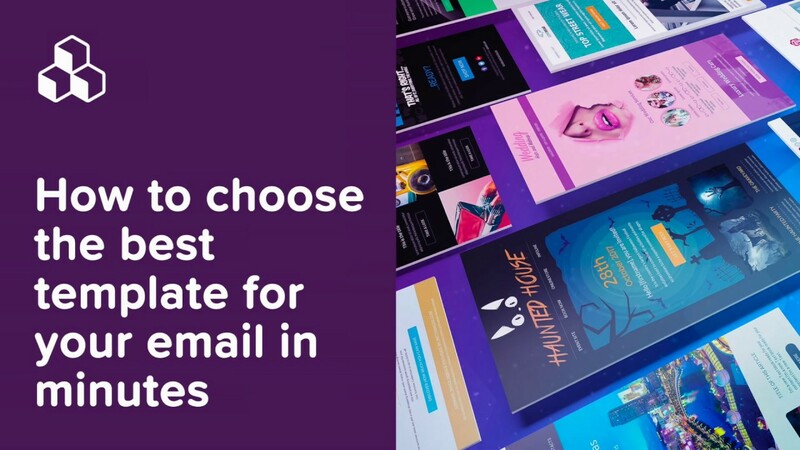 If you have multiple call-to-actions, make sure that those different sections of the email are visually separated using plenty of white space, different background colors, full-width images, etc. 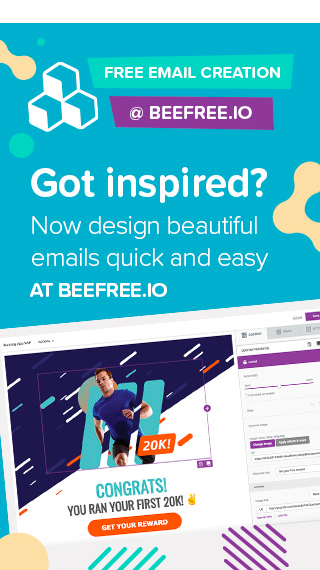 The growth in email clients that download images by default encourages email designers to be a bit braver. For example, good support for GIF animations means that we can insert a bit of fun in some of our messages (don’t do it all the time, and make sure the first frame is a good one: it’s shown when the animation is not supported). 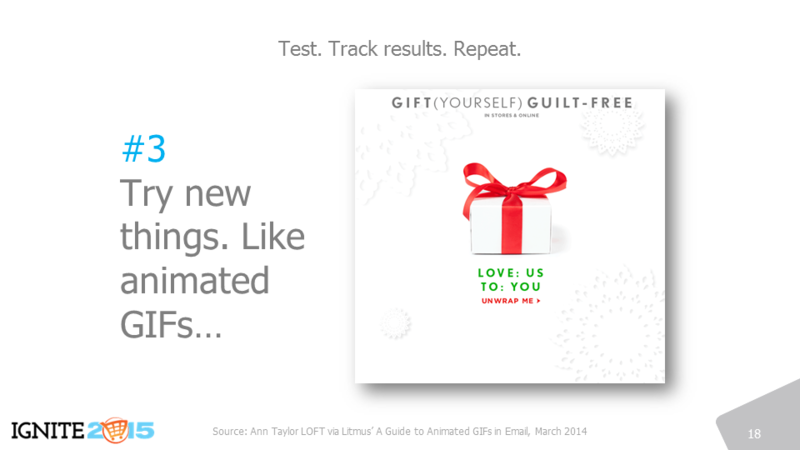 In the slide below, the gift in this Ann Taylor LOFT email shakes a bit: a cute little animation that definitely catches the eye. See the animation. And introducing live content like countdown timers, dynamic maps, etc. is now within reach. For example, check out the work by RealTime.Email. Try new things. Track the results. Keep testing. It’s time to be creative. #4 – Good, old text delivers! A somewhat controversial report by HubSpot found that – according to their data – the click-through rate in an email decreases as the number of images increases. What? Weren’t images supposed to help? Well, yes and no, as we’ll discuss below. But one thing is for sure: text – when used correctly – works. 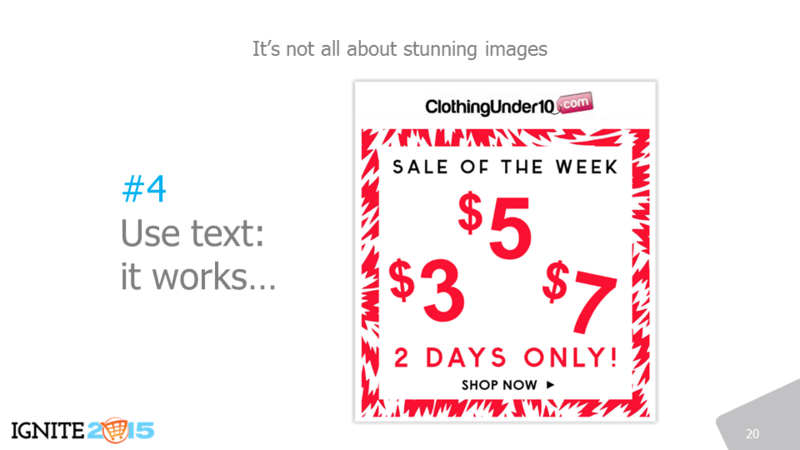 When I researched the highest performing emails (based on click-through) of all MailUp customers in 2015, one of the best ones was the message shown in the slide below, by an online merchant called ClothingUnder10.com. As you can see, it uses plenty of text… but creatively so. Using text doesn’t mean not using images. In fact, in many cases it is indeed text within an image. Using an image allows you to do things with text that would otherwise be impossible to achieve in an email. The lesson from the HubSpot study, in my view, is that focus pays off (so we go back to design tip #2). A message with a large amount of images is likely much less focused than one with fewer images. 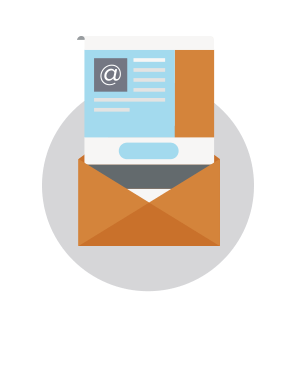 A text-focused email, instead, tends to contain a clear message and call-to-action. 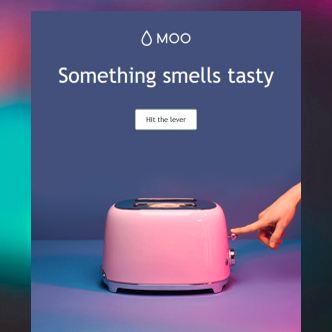 And a more focused message appears to perform better (in terms of click-through). 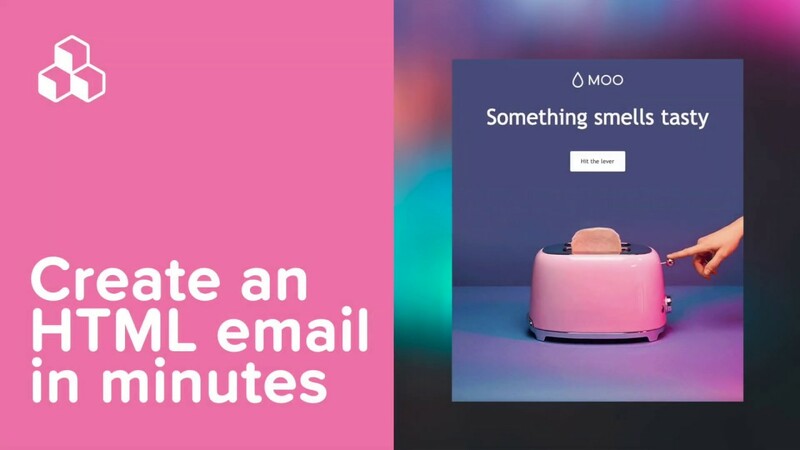 The final email design tip is actually not about email. 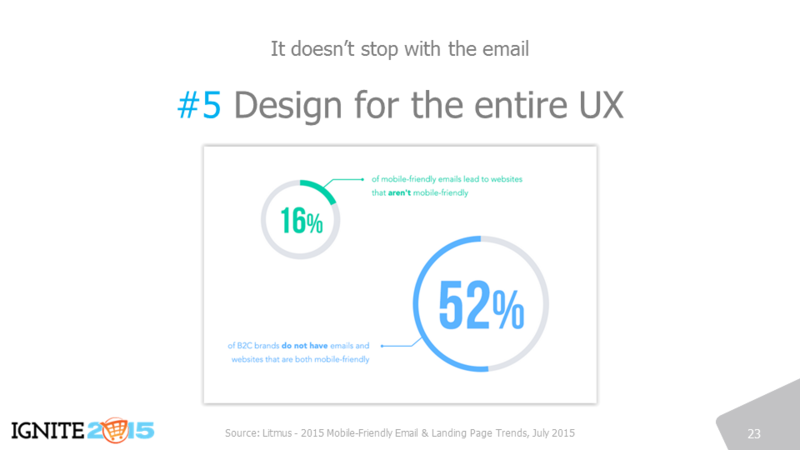 A mobile-first approach to email won’t do much good if the rest of the user experience is not mobile-ready. The work cannot stop at the email design level: landing pages, shopping carts, checkout pages, … you name it. Everything must acknowledge the new, mobile-first reality. It seems like a basic concept, but anyone that’s worked in this space knows how hard it is to connect all the dots. Not surprisingly, Litmus reports that 52% of B2C brands still don’t have the entire UX mobile-friendly. 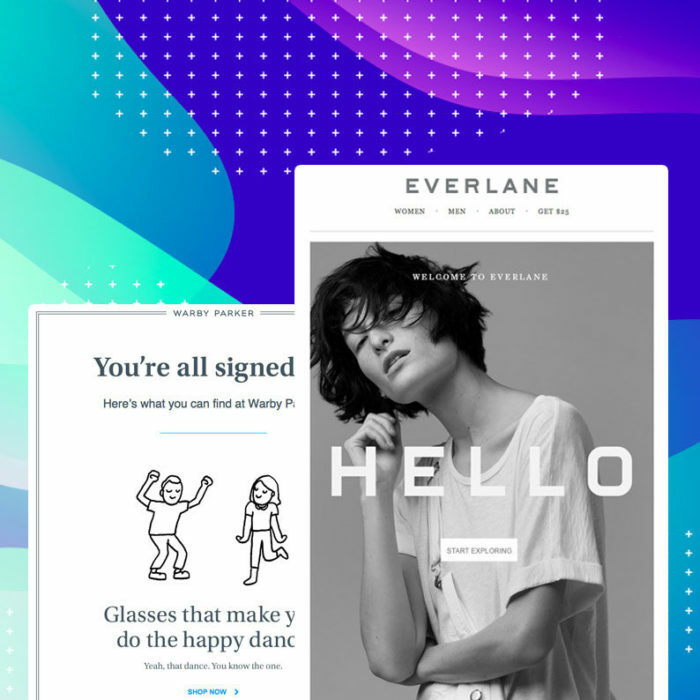 Email design for ecommerce conversions cannot stop at the email. It’s hard, but it must be a priority. … and then it’s time to go have fun designing emails. To download the full presentation, click here. See you next year at another email session at Practical eCommerce Ignite.